Whether warm and fuzzy or elegantly squamous, pets are cute. But photos of them too often plunge down the taste ladder into cutesiness. Websites like the famous Disapproving Rabbits have figured out the perfect blend of cuteness and sarcasm. When animals appear to glare, withering captions spring to mind, and a long-lasting Internet meme is born. 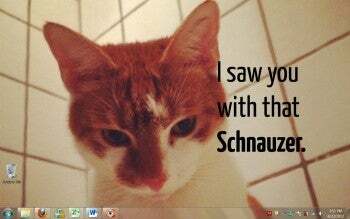 In this free Windows 7 themepack, PCWorld has populated a virtual Snootiest Pet Shop for your (dis)pleasure. This cat, along with the other animals of These Pets Disapprove, will teach you the meaning of disdain. Members of the DeviantArt community share photos of their disapproving pets. When PCWorld editor Kim Saccio-Kent gazed into the soft, reproachful eyes of the dog in AGoldenHeartBeats's "A Disapproving Look," the captions started writing themselves. Read the condescending minds of common house pets with mobbe-pingvin's "Disapproving Cat" and Rachel Leah Blumenthal's "Disapproving Pug." If exotic animals are more your thing, writhe in discomfort under the scorn of Fayesie-Daisie's "Disapproving Iguana," Spyrre's "Disapproving Llama," A. Jaszlisc's "Cardinalfish," and PossibleHeartbreak's "We Are Not Amused." No collection of animal contemptousness would be complete without a rabbit; CrazySparkles06's "Bunny or Sphinx?" gives us the hairy eyeball. Having this themepack on your desktop is like having both Cute Overload and The Onion open in your browser. If you've ever longed to see a pet's unconditional love leavened by a bit of wit and discernment, you'll be relieved to learn that These Pets Disapprove.